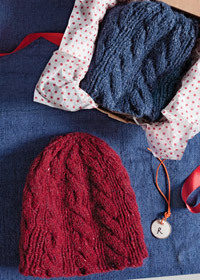 I recently had the opportunity to review Great Little Gifts to Knit by Jean Moss. It strikes me as the perfect time of year for such a book because I was just putting together a little list for the holidays. It may seem early but we all know how quick these things creep up! First up, something for baby. As you may have guessed I LOVE knitting baby gifts. 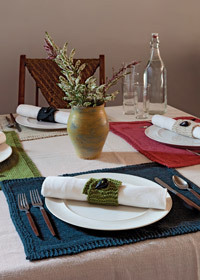 They are quick and small and use very little yarn. Perfect! I am adoring the Whoopla Beanbags. While Hunter isn’t quite coordinated enough for juggling, she and Jones do love to throw things at each other. Beanbags are perfect, very little damage done! These beanbags are knit up in a cotton and Blue Sky Skinny Cotton fits the bill, lots of colors to choose from. Next up is something for her, the Jive Leg Warmers. Simple cabled leg warmers in Rowan Big Wool, they are a snap to knit and stylish too. The perfect stocking stuffer! Hugs socks. Need I say more? 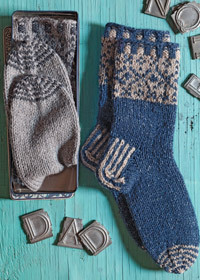 Worsted weight socks (I am a big fan of a heavy weight sock), with fair isle too! A wintery delight for anyone on your list. There you have it, my faves! 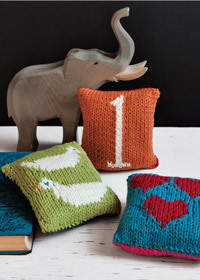 There are, of course, 27 more beautiful patterns to choose from so pick up a copy today! This entry was posted on Thursday, October 3rd, 2013 at 10:46 pm	and is filed under Uncategorized. You can follow any responses to this entry through the RSS 2.0 feed. Both comments and pings are currently closed. this looks like a lovely book – I have already earmarked a couple of patterns to make. now I just need to get to the book store to buy one. From the very first time I saw this book, I’ve been in love with those bean bags and can’t wait to make them for my little boy. He’s just starting to grab stuff and squirm towards things. I can’t wait until he gets to play with these. Thanks for hosting!